* The crux of it is the new FOGO bin (with a lime green lid) will be collected weekly. * The recycling bin (with the yellow lid) will be collected fortnightly, as it is already. * The new, smaller general waste bin (with a red lid) will be collected fortnightly. * The potentially smelly stuff that currently goes into the big green general waste bin will now go into the FOGO bin, which is still collected weekly. Once you take out the FOGO and recycling there shouldn’t be that much left to go into the general waste bin (and nothing smelly either), hence the fortnightly collection. IS FORTNIGHTLY RUBBISH COLLECTION A GOOD IDEA? The City of Fremantle will be rolling out its FOGO three-bin rubbish collection from July/August this year, when 13,000 households will be receiving the Food Organic Garden Organic bin in addition to the normal household rubbish bin and the recycling bin. It is going to cost around $ 1.2 million. The Town of East Fremantle will also be introducing the FOGO bins, and so do other councils around Perth. But to save cost and not collect near empty bins the Town of Vincent, which has also embraced FOGO, has decided it will introduce fortnightly collection instead of weekly ones, and I wonder if Fremantle Council might be contemplating the same and what Freo residents would think about that. Any thoughts? Some traders in Fremantle’s popular Wray Avenue claim that the City of Fremantle fails to clean their street regularly. Calls to send the street sweeper have been ignored they say, while one shop owner sent me a photo of a gutter full with leaves when the City had stated that the street sweeper had been through there. Down in Beaconsfield a home owner has been asking for a replacement rubbish bin for over ten days but nothing has happened and the damaged bin is still out on the street. At the same time Fremantle Council has signed off on spending over a million dollars to introduce a third-FOGO– bin. Maybe best to do the basics first hey! Students of Fremantle John Curtin College spent one hour on cleaning up Port Beach recently and were amazed at what they found in such a short time in winter. Cigarette butts 166, Cigarette lighters 3, Straws 20, confection sticks and cups 50,Lids and tops 27, Plastic drink bottles 13, Plastic food packaging 38, Cylume glow sticks (mini) – recreational fishing 6, Recreational fishing items 15, Rope and net scraps less than a metre 17, Rope in metres 3 and Plastic bits and pieces hard and solid 162. Others: Foam buoys 3, Earplugs 8, Glass beer stubbies 4, Broken glass 20, Cloth 9, Aluminium cans 5, Metal bottle caps 29, Paper and cardboard packaging 136, Rubber balls 1 and Rubber remnants 12. One has to wonder how much other rubbish ended up in the ocean before the students collected it. It is disgraceful that so many people believe someone else will clean up after them and leave their rubbish behind. My Freo’s View blog might not change the world but it does make a difference sometimes in Fremantle. The illegal rubbish dump on the corner of Suffolk Street and South Terrace, that I reported about on Tuesday morning, is already being cleaned up. Three skip bins were being filled with the waste yesterday. That is an amazingly fast response from the City of Fremantle and I thank the officers involved and the elected members who took the issue on. Well done all! And thank you also to resident Kim D’Alton who made me aware of the issue. It is an utter disgrace that the vacant property on the corner of Suffolk Street and South Terrace, opposite the Fremantle Hospital, is being used as an illegal rubbish dump! It is unacceptable that people believe they can just do about everything and I doubt the many shopping trollies were thrown over the fence by someone, so is the owner responsible for it? Rubbish attracts vermin, rats, seagulls, etc and is a health hazard that needs to be removed with urgency. On your bike City of Fremantle and get the crap removed by the property owner! Comments Off on IT’S A BLOODY DISGRACE! THANK YOU TO VOLUNTEER BEACH CLEANERS! Thank you, thank you, thank you! to all those dedicated volunteers who regularly clean up our beaches from the rubbish people leave behind or throw into the Indian Ocean. It is an utter disgrace that there are so many people who believe others will clean up after them, as we see also at markets, festivals, concerts etc. where people simply walk away and leave food and drink containers as if it is none of their business to dispose of it properly in amply supplied rubbish bins. I spotted a small group of Tangaroa Blue Conservation Volunteers at Fremantle’s Bathers Beach this Sunday morning. Well done! Comments Off on THANK YOU TO VOLUNTEER BEACH CLEANERS! It seems no one in Fremantle wants to take responsibility for taking away this piece of floor cover left there after a Fringe Festival event inside the Whalers Tunnel. The eyesore has now been laying in our prime tourist destination below the Roundhouse for two weeks, but because it’s not in a rubbish bin and can’t be swept up by the motorised sweeper the City of Fremantle just leaves it there. Of course one would have expected more professionalism from the event organisors and for them take their rubbish with them after the event. Disappointing! Fremantle has been full with people enjoying the festive season holidays and a very long weekend and Bathers Beach has become popular again, so why has the place been looking like a mess since New Year’s eve when there was a DJ dance event on the northern side of the beach? We had nearly 600 visitors in the Round House yesterday, and the J Shed area is a short cut for many tourists to get to and from the Maritime Museum, but this is what they have to put up with because the City of Fremantle once again has not cleaned up the rubbish left there. 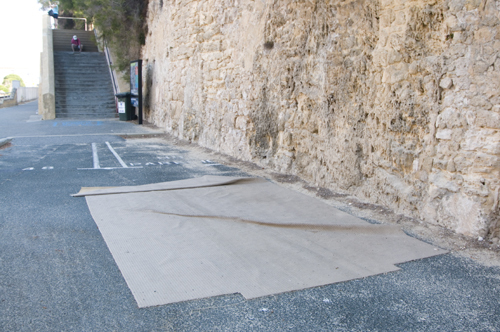 Once or twice a week cleaning of prime tourist destinations is not enough and not good enough. This has to be a daily routine, even-or even more so-during the festive season when more people come to Fremantle.